Nov 08 -10 , 2016, XXI - National Symposium on Ultrasonics (NSU - 2016) 21st National Symposium of Ultrasonics Society of India(USI) was organized by the Department of Condensed Matter Physics and Material Sciences, S.N.Bose national Centre for Basic Sciences from 8th to 10th November, 2016. The symposium covered all aspects of ultrasonics and related areas including their applications in medical imaging and materials testing. Training program on "Right to Information Act, Lokpal & Lokayukta Act"
An in-house training program on "Right to Information Act, Lokpal & Lokayukta Act" has been organized by 'S N Bose National Centre for Basic Sciences' in association with 'National Council for Training and Social Research', New Delhi from 15th to 18th November, 2016. The program covers several aspects of the mentioned laws with special emphasis on implementations. Observation of Vigilance Awareness Week 2016 from 31st October to 5th November, 2016 at S. N. Bose National Centre for Basic Sciences. 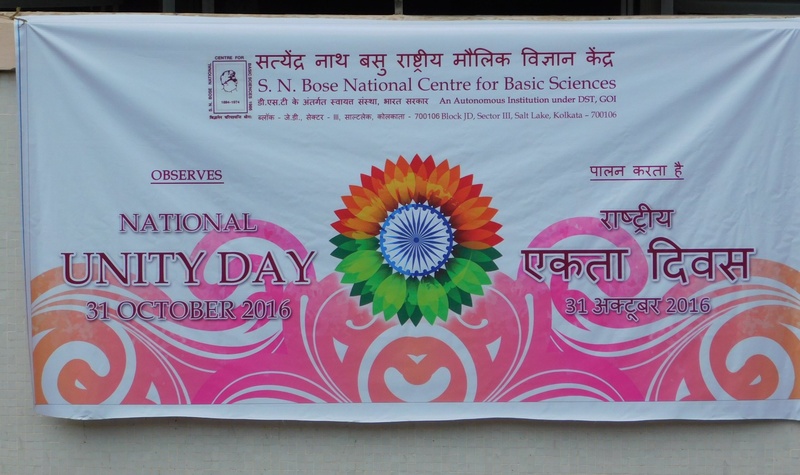 Celebration of Rashtriya Ekta Diwas (Commemorating the birth anniversary of Sardar Vallabhbhai Patel), 31st October, 2016 at S. N. Bose National Centre for Basic Sciences. Mr. Hrishit Banerjee is going to deliver an oral presentation entitled "Electronic Structure of Oxide Interfaces: A Comparative Analysis of GdTiO3/SrTiO3 and LaAlO3/SrTiO3 Interfaces" in the international Conference "2016 MRS Fall Meeting", Boston, USA, on 28th November, 2016. 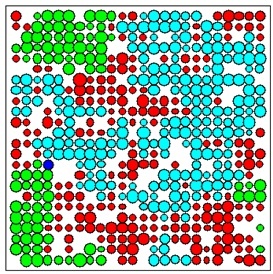 The Percolation model is well known for studying the properties of disordered systems, e.g., a conducting material in presence of non-conducting (insulating) impurities. Such a model, defined on a regular lattice, whose sites (bonds) are filled by p fraction of conductors and (1-p) fraction of non-conductors are called as the Random Resistor Networks. Such a simple system exhibits non-trivial phase transition at a percolation threshold p_c, when the system just starts conducting. As p is gradually increased, the largest cluster of conducting bonds spans the entire lattice and is called the "spanning cluster". However, only a tiny part of the spanning cluster carries the current, which constitute the backbone of the cluster. There are many dangling ends of all length scales which belong to the spanning cluster, but do not carry current. Presently, we are studying the size distribution and different moments of these dangling ends in 2d. Preliminary calculation indicates it to be a power law decaying distribution, and we are trying to relate its exponent with other known exponents of the percolation problem.